Wow! This picture was sent to me by an old friend. 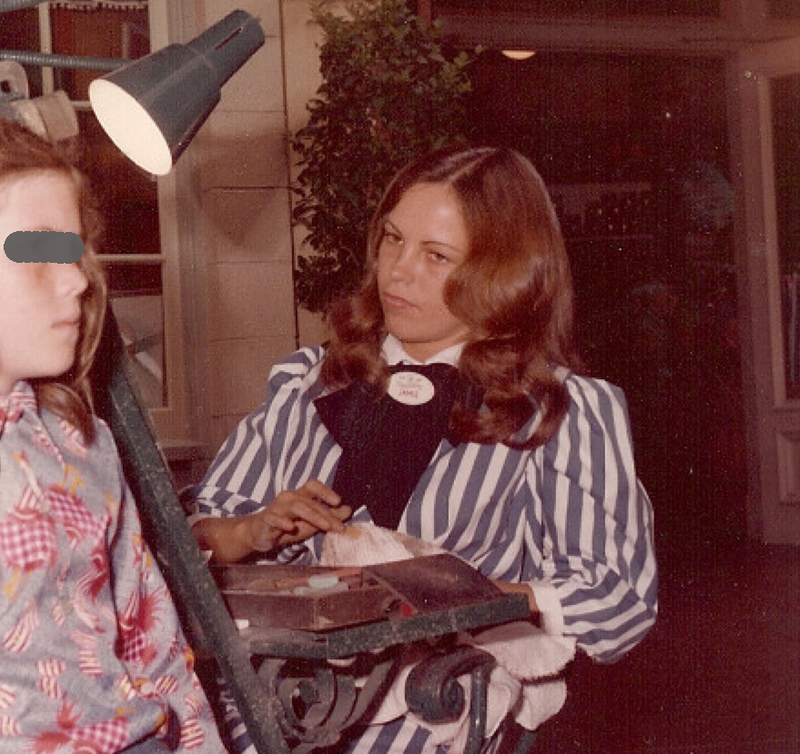 Many, many moons ago I worked at Disneyland as a portrait artist on Main Street. Any guesses what year? I’ve also worked there as a caricature artist and silhouette artist. In fact, I believe I’m the only person ever to have done all three. It was a BLAST! Hi Zack. Thank you for commenting on my blog. Not quite that old. I was hired right out of high school in 1976 as a portrait artist on Main street and at the end of that year we were shut down, years later to reopen in New Orleans. The following year I was hired for a 4 week caricature training session with 11 other artists and at the end of the training I was one of 2 that were kept on as sessional employees. I’ll tell you that I didn’t work for the subcontractor Rubio, I worked for Disneyland. I worked with Barry, Amy and one other guy that I can’t remember. I was mainly stationed in the Arcade in Tommorow Land. Very fun but not there any more. After they closed that stand down I had become friends with the main silhouette artist on Main Street, Harry. He trained me free, on his own time because they needed another artist. I was there until 1987 and quit to stay home as a new mommy. It was a lot of fun, and great for the ego, but the pay was terrible and the hours were worse. It gave me a good base for hiring as an entertainment caricature artist and I’ve been doing that, on and off, ever since. I hope this all makes sense as I have a tendancey to ramble. I took a look at your site. I really like your style. I’ll look more later. Sorry I didn’t know Tom. Was he your dad or something? If you want to know more about what it was like, please ask. I’m afraid I’m babbling too much, and if I start I won’t shut up but right now I need to get back to my ps file. Thanks again. Jamie ……… Bwahahaha, that model is probably 40 now. Thanks very much for the above Jamie, appreciate you sharing a bit of your background as a caricaturist. I’ve heard of Jess Rubio but don’t know much other than that he was well-known concessionaire here on the west coast in the 70’s, 80’s…. Hi.. I worked there as well in 1976 as a pastel portrait artist…along with Dawn Mcgill she made chalks that we used for hair…garry, Janet, val, Randy and I think phillip…we worked off of main st and had a button that we pressed for the next person in line… we worked grad nites as well …i worked directly for Disnsey and was hirered by Chuck… i was only 19 at the time and lived in anahieim… along with some other Disney people… you can contact me if you would like at mgdefran01@yahoo.com my website is michaeldefrancescostudio.com …cool…that picture sure brings back fond memories…even that pastel rat tail sharpener… wow…i think thats what we called it! Hello, Jamie, I stumbled onto your blog post about doing portraits at D-Land while I was doing a search to see if the artists were still there. I also did portraits, but in New Orleans Square. I worked for Rudio and it was probably better than being a regular employee. By 1986 when I started there the Walt Disney Company’s style of management was nothing less than intimidation, as you probably know if you left in ’87. But we definitely had it a little easier. I recognize the easel and chalk tray in your photo and it sure brought back memories. I’m planning a trip there in the fall and was hoping to stop and chat with the artists. Haven’t been there in almost 2 decades! They wouldn’t allow us to do caricatures due to too many complaints about “racist” drawings, and idiotic things like that. But when it was slow, and no “Disnoids” were around (our term for management), we’d do them anyway and it always got business to pick up. Though the job was hectic, and for little pay, I really liked the people I worked with and have remained friends with many of them. You’d be surprised, or maybe not, at how many of us went on to have successful careers as artists, and still laugh about those crazy days whenever we get together. Anyway, thanks for the post; it’s neat learning about the artists there before me. Now I definitely have to get down there soon! Hi! You’re the second portrait artist to find my site. It’s nice to hear from you. It doesn’t surprise me at all that most of us became successful artists. It took a considerable amount of talent, skill, and courage to do what we did. I took a look at your site…..absolutely beautiful. Your work is lovely. Where are you located? I looks like you’re doing very well. I especially like your Sirens. I drew portraits only for one year in 1976. They closed us down at the end of that summer. Fortunately I was able to continue on when they opened a new caricature stand in TomorrowLand and that turned out to be a lot of fun and my jumping off point for many endeavors. Interesting they wouldn’t let you do them. I always wondered what it was like to work for Rubio. Did you know Shiela Jackson? Hi Donnie, What a surprise that you still have your portrait from 76. The signature you discribe isn’t mine but I think I might know who it is. I can contact this other artist for you. Could you share a picture of the portrait? Hi Susan, It’s so nice to hear that you still have your portrait and seem to be still enjoying it. I only remember the names of a couple of the men that worked out there. Is it possible for you to post a picture of the portrait? About how old was he at the time? The Main Street artist’s were closed down at the end of 1976 so it may be very difficult to find who it was. After reading your site I realized that their were many artists who worked for Disneyland with various art backgrounds. And it was a shock to realize that some worked for Jess Rubio and and not directly for Disney.Naive me!!! I now live in Southern Oregon and unfortunately do not have access to the portrait ,for it is in storage in Portland. I plan on going up there in June so I will jpeg it then. Additionally,I really enjoyed viewing your art and seeing all the different types of artwork that you have done. You a prolific and gifted artist. Susan, Thank you so much for the kind compliments. I so appreciate it. Yes, DL was a great place to work, but there were many of us in different fields. We portrait artists on Main Street were Disneyland and not Rubio. I think the ones there now, in New Orleans and on the bridge in Ca Adventure, are Rubio but I could be wrong. Thank you for finding me. I look forward to a jpg of your portrait. Hello again-Time sure does fly.Well I found the portrait and to my amazement ,it is signed, Willis Parker. Funny it was signed in pencil and was so softly written ,it blended in with the pastels. Do you know him? I finally have a site on Fineartamerica.com under Susan Brown Brookings OR Its free for now and I needed a place for gallerys to look. Hi Susan—came across yesterday some pix on ebay of Disneyland artists at work right around the same time as your above pic—in fact they look like they’re even from the same camera (!). I can send them to you if like…..
hi Zach, I hope Susan gets this message. How did you find the pix? I just looked and couldn’t find them. I like your caricatures btw, nice likeness. How fun. That artist is in New Orleans (Disneyland) and they opened that stand after we were closed down on Main Street. I never got to know any of those artists since I went the other direction into Tomorrowland and the Arcade Caricature stand. It was all a lot of fun. Thank you.